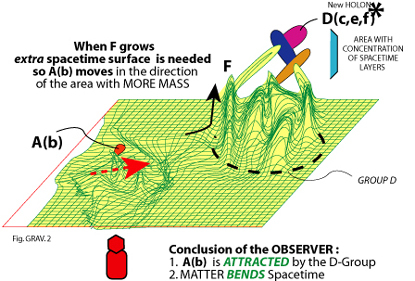 Spacetime is the Einsteinium expression of the M-Brane in a dynamic sense (movements in time). Where in General Relativity spacetime is not a realworld event, it is here in our pelastratic approach. Spacetime - as the gravitational brane - is geometrically present in every fundamental particle, multi-multi layered in every atom, in every molecule, in every cell. As in GR ... also pelastratic spacetime 'ripples' or oscillates (waves like a table napkin moves in the wind or like the sea surface). In our concept spacetime is very dynamic. It is in CONSTANT movement. When on certain spots holons are created the local stretchability changes or deforms. We really do not know what space-time is, other than two clues afforded by quantum mechanics and general relativity. General relativity as developed by Albert Einstein, says, and this is a direct quote from Einstein, that "Space-time does not claim existence in its own right, but only as a structural quality of the [gravitational] field" (from: The Special and General Theory page 155), but Einstein's asserted that spacetime is a fundamental field in nature as an underlying metric (g-mu-nu) to the world which like a cake, supports the frosting which we see as the gravitational field, g-uv. .... Prior-geometry theory sees "g-mu-nu" as being actually a compound object in disguise; one part being the gravitational field, the other part representing a pre-existing and immutable arena of spacetime. Einstein had a strong opinion about the issue of prior-geometry. His choice was that the gravitational field represented EVERYTHING, with no pre-existing framework for spacetime. This assumption, as provocative as it seems, is the simplest one consistent with all known phenomena. In a quotation from Abraham Pias book Subtle is the Lord page 235, Einstein once remarked that "...[prior- geometry] is built on the a priori, Euclidean four-dimensional space, the belief in which amounts to something like a superstition". So for Einstein: g-uv = g-mu-nu. Now to me there is a difference between the Prior-Geometry and the metric. g-uv ≠ g-mu-nu. Prior-Geometry represents the potency of everything. As such it is the un-structured boundary, which is dynamic. 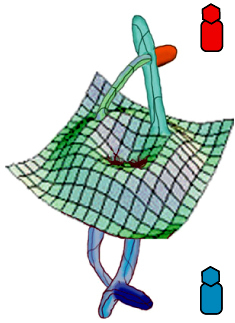 Below image shows a possible shape. The essence is however a continuous oscillating surface. The source of the dynamics is - actually - un-known. We judge dynamics to be a property of the system because we observe various forms of dynamics in daily life and in experiments. The boundary is the gravitational field or spacetime. Once two parts are coupling (one being an active and one a passive part) a double layered new local 'discrete' zone is created. (see creation of holons). A human observer/participant or instrument will judge such local zones (quanta) as being matter if there is sufficient density (inside layers). The Prior-Geometry dynamics leads to dual building blocs (quantum packages). Spacetime - as Einstein's gravitational field - represents everything ... without a real framework (since it is pure membrane chaos). Couplings of membrane create locally non-chaos : discrete zones with (relative) stabile structure. So 'gravity' is intrinsic. It is thus omni-directional. The observer will appreciate it as push or pull depending from his position relative to the event and his side of the brane. In the image on the left the blue observer can not notive the red event, but might observe a 'strange' (gravitational) push and/or pull effect. This image was shown on Greene TV show, but it doesn't explain how those marbles are created. The illogic in this concept is that there is a schizoid split between an object and it's gravity properties. Why do the objects have not their gravity inside/embedded? Indeed wherever the object goes the gravity is all the time a part of it. One of the fundamental WRONG approaches is the expression: "Matter creates Gravity". Matter is gravity. Next image explains that. Above image is included in a pdf-file (webpage). In this image I show how the holon A(b) is moving into the direction of the D-group of holons. The D-groups has a lot of deformations in the spacetime pillow. This zone is highly materialized. (much layers = much mass). (1) While the D-Group grows (additional pelastrations) the A(b) holon moves towards the D-group zone! The reason is very simple: growth of the D-group USES surface of the spacetime pillow between the group of holons and the single holon. To an observer this will be like A(b) is BEING ATTRACTED by the 'heavier' D-group! (2) When the D-group moves (you tear on the spacetime pillow or you move the group or one holons of the D-group ) ... also the single holon A(b) will move immediately in the direction in which the denser matter D-group goes. Isn't that the effect what we call GRAVITY? So the more holons (cf. knots) we make in spacetime pillow the higher the local 'density' (or mass) and the more 'attraction effect' (on less massive holons) we will measure. We call that attraction gravity. That's why gravity occurs ... . In my approach spacetime can locally double, triple and combine in many ways ... making discrete quanta with extra spacetime layers and unique properties. Gravity is just an expression of causal con-'sequences'. Space + time really exists as a real dynamic boundary. You can even call that the boundary of the singularity. Matter and light become then restructured singularity or restructured spacetime. Is Energy Conserved in General Relativity? by Baez gives you a good idea what parameters are involved in General Relativity. One of the predictions of Einstein's general theory of relativity is that local spacetime is twisted by the rotation of the Earth. Hans Thirring and Joseph Lense called this "frame-dragging"- any rotating mass will drag the local spacetime frame of reference with it. A link on this. Here a simple and sweet explanation with honey.